Things like how incredibly happy and grateful I am that we switched the clocks forward Sunday. And like how much hair spray I sprayed in my hair to get some curls to last for all but an hour. 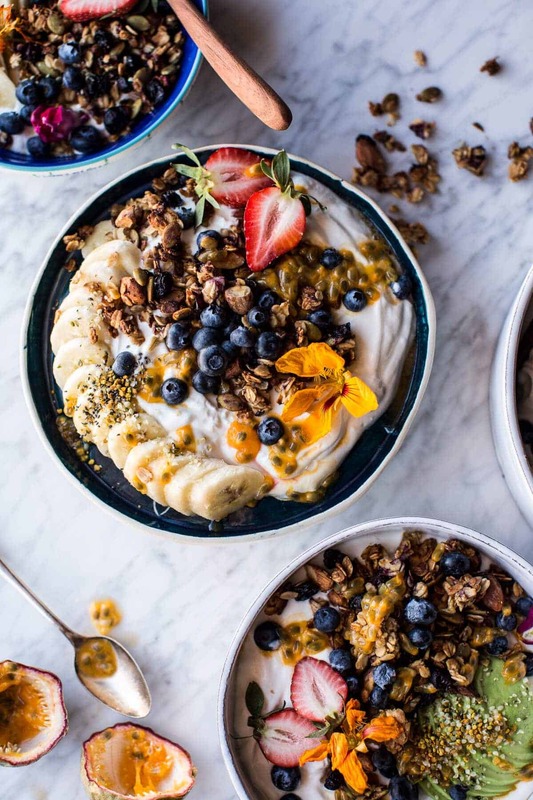 And umm, hello these Blueberry Muffin Granola Greek Yogurt Breakfast Bowls!!! Let’s start with daylight savings time. Ahh!! I am SOO happy that I now have an added hour of sunlight. For me personally, this makes my work day so much easier. For the last four to five months I have been in a constant state of GO, GO, GO when it comes to shooting recipes for the blog, the book and other projects. When the sun sets at four it’s kind of my worst nightmare. Now that it’s not going behind the mountains until just after six I feel like I can breathe a little throughout my day, maybe stop and take a sip of tea and like go to the bathroom… simple pleasures. My day is not so rush, rush, hurry, hurry, the sun is setting. YESSS! Clearly pretty pumped about this. Also, the longer days can only mean one thing, spring is pretty much here, and with spring comes snow meltage! Well at least I hope it does… at this moment there is a winter weather advisory in effect for 6-12″ of snow, and more snow is forecasted for the remainder of the week… Anyway, soon enough summer will follow. Hip, hip, hooray!! Okok, second?!? Over the weekend I did a lot of things in front of the camera, which meant me with my hair down and clean clothes on. If you know me than you know I have the straightest hair on the planet. Like not a curl in site, BUT when I take it out of my tight, top-knot buns that I religiously rock on my head, I have major curls…for about two seconds… until they fall flat. I am sure that all of you girls out there with thin, fine hair feel my pain. Anyway, on Saturday I decided I would just go for it and spray mass amounts of hairspray on and see how it went. Hairspray usually never works for me, but guys I found the trick, just spray and spray and spray…it totally cannot be good for you (or the environment…or your hair! ), but it sort of worked for a while. Of course my hair was hard and stiff as a rock, but you know, you gotta do what you gotta do. Honestly though, I am so not a girly, girly girl. The tom boy in me wanted my hair up. I guess the girly, girly gene went right to little miss Asher. Ok, but anyway, now let’s get serious. Let’s talk yogurt bowls. The ultimate breakfast and or afternoon snack. I know a lot of you may think that I eat some fancy breakfast every morning, but let’s be real, no one, including me, has time to make french toast on a daily basis. I mean, don’t get me wrong, if I had the time I totally would, but life happens, and that is when these yogurt bowls come into play. 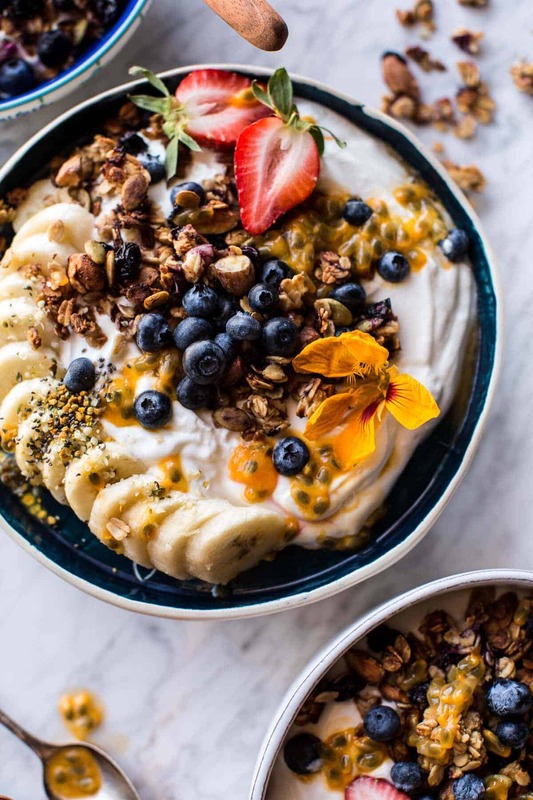 No joke, I eat greek yogurt pretty much every morning for breakfast paired with fresh fruits, granola and basically any other fun toppings I have on hand. These bowls are just a fancier version of my daily breakfast. 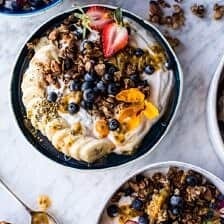 I try to always have homemade granola on hand for breakfast and snacking, this recipe has quickly become my go-to one. It’s simple, low sugar and so good. Think blueberry muffin with a hint of lemon, but in granola form. Delish, right?!? It totally is. I like using fresh berries, but dried berries work great too. And the bonus of using dried is that the granola will last a lot longer than if you use fresh. That said, granola never lasts longer than a few days in my house anyway…it’s kind of addicting. 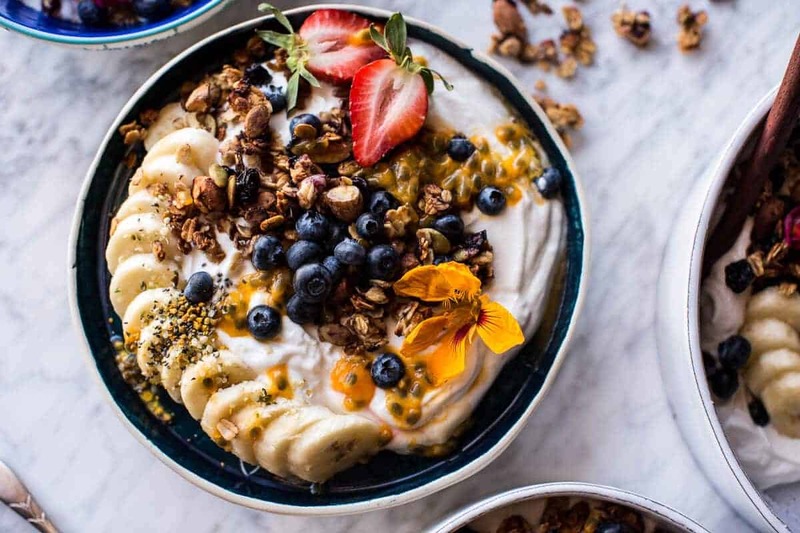 Once you have your granola, the options for your yogurt bowl are pretty much endless. I went the tropical route and added bananas, passion fruit and a handful of fresh blueberries. Ok and this might sound weird, but I also love adding sliced avocado. Trust me on this, just try it and you will see!! And yes, I am definitely having a moment with avocado these days…along with tropical fruits and bowl food. Finish with a drizzle of honey or maple syrup for a little extra sweetness. Delicious healthy breakfast = ✔. Perfect for busy mornings, snacking or a meal on the go. The ultimate breakfast and or afternoon snack. To the baking sheet, add the oats, almond and pepitas. In a small sauce pan melt together the coconut oil and maple (or honey). Once melted stir in the vanilla, mashed banana and lemon zest. Remove from the heat and pour the mixture over the oat mix, toss well and sprinkle with salt. Stir in the blueberries. Bake for 25-30 minutes, stirring 1 to 2 times throughout cooking. The granola is done when the oats smell toasted and are golden brown. Allow the granola to cool completely. Store in an airtight container for up to one week. Spoon a little yogurt into a bowl. Top with granola, fresh fruit, avocado, seeds + nuts. Drizzle with honey or maple and garnish with edible flowers if desired. EAT. 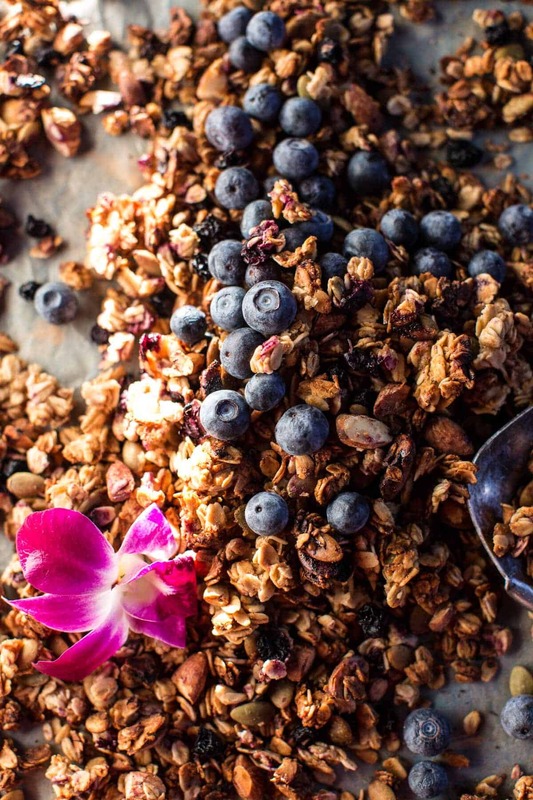 love the idea of using fresh blueberries in the granola! it sounds like they’d dry out into the perfect bite of juicy/chewy fruit. We’re driving from New York to Florida and Friday and this is the breakfast I’m making the fan before we head out! Your hair comment was interesting. My wife had super thick poker straight hair……until she had a baby and now it’s super curly and she LOVES it. Have a fun trip! Thanks! Second, Do you already have daylight savings time? In Denmark it starts March 27th. You can replace the bananas with 1/3 cup of maple syrup. That will be great! Yup, we started on Sunday. Thanks so much and let me know if you have any other questions. Thanks! I feel your pain! My hair doesn’t even curl after I take it out of the bun, it looks like I brushed my hair upside down and just went with it goosshh! Anyway, I’m so happy about being close to summer, for these kinds of bowls and salads! I could totally go for one of these stunning bowl! 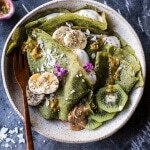 I love all the fresh toppings and the addition of avo is something I have to try! This is a perfect afternoon snack!! They look so good and delicious! Sometimes I wish I could eat blueberry muffins every day for breakfast but I guess this could be the perfect way to do so! Love it! Thank you! Hope you love the granola! These bowls! They are beyond gorgeous! I totally agree Tieghan, these bowls are the perfect breakfast or afternoon snack! Granola doesn’t last long at our house either! So addicting! Mmmmm! 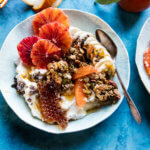 Please bring me a bowl for breakfast this morning (: This granola recipes looks fabulous. I love the nut and seed combo that you used and as always, you’re pictures are incredible! 2. There’s nothing like a lot of hairspray to make that “do” stay in. Here’s a trick to help it stay put even longer. Gather it up on top of your head (you may look like a palm tree but who cares right?) If you sleep with it like that it will hold the wave! Tieghan, these are gorgeous! I love the extra hour of sunlight too, it’s like every photographers early birthday present. ?? 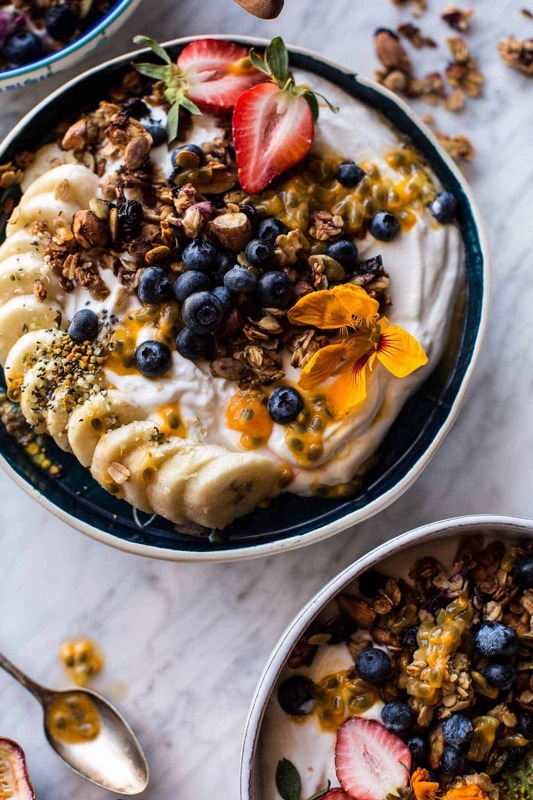 This looks delicious, I love Greek yoghurt with various toppings and I really like the idea of using fresh blueberries for the granola, not so sure I could get on board with the avocado though! Give the avocado a try, it’s good! Thank you! I love daylight saving time! I love how it is light later in the summer. I get really really annoyed when people talk about how much they hate it. I am with you. Thanks! Gorgeous as usual! Lately I’ve been stirring in cocoa powder and chopped hazelnuts to my granola mix because I can’t live without chocolate. Chocolate with breakfast? Yes please! BUT, can we talk about how beautiful your Greek yogurt bowl is! I bet that it does taste like a blueberry muffin! haha! Thanks Cassie! Hope you are now caught up on sleep! Oatmeal loaded with blueberries is always a winner, but that granola really adds an extra punch! Yogurt breakfast bowls are my favorite breakfasts! Especially when it tastes like dessert; love this! The extra hour of sunlight means so much when you’re a food blogger. Now back to this delicious bowl, It’s 10 am here and all I wish for is this bowl!!! Thank you so much, Layla! Hope you are having a great weekend!! 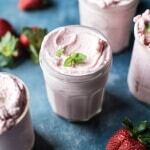 The recipe sounds deliciouse but are is no vanilla or lemon zest mentioned by the ingredients while you name them in the recipe. Is the vanilla and lemon zest needed or can they be taken out? Hi Laura! Thank you so much, the vanilla and lemon zest are added to the granola. I will fix the recipe now. So sorry about that, but thank you for catching it. Let me know if you have any other questions, hope you love this! ? My granola did not get crunchy….what did I do wrong? Hey Jana! Was your granola clutter on your pan? That can cause the granola to steam instead of get crisp. Maybe you should divide the granola between two pans. Let me know if you have questions. Thank you! Hi what can i replace the coconut oil for? Hey Muriel! 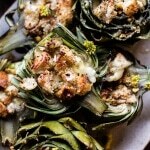 You can use melted butter or canola oil. Let me know if you have questions. Thanks! This is the first recipe that I’ve tried of yours, and wow, I will definitely be coming back for more! I made this over the weekend and I can’t get over just how much this tastes like banana bread, but in a granola form (my two favourite things!). Even my boyfriend (who hates anything sweet for breakfast) is a big fan! Thank you for sharing, I’ll definitely be back for more! Yay! So happy you two liked it!